The emergence of the so-called 'Rising Powers' - including but not limited to China, India, Brazil and Russia - represents one of the key drivers of global economic and social change. The Rising Powers and Interdependent Futures network funded by the Economic and Social Research Council includes 12 research projects at ten universities across the UK that explore these ongoing changes. The emergent economies, most notably China, India, Brazil, South Africa, and Russia are no longer ‘emergent’. They are at the centre of the global stage. As economic actors, these Rising Powers exercise large-scale influence on: global governance; global production, trade, labour and financial flows; the environment; the generation of new knowledge and innovation; and geo-political relationships. These changes have implications for other developing countries' engagement with the Rising Powers. They also have consequences for the developed world as it negotiates new relationships and partnerships with the Rising Powers. We are, thus, witnessing a key transformative moment in world history, with implications that will shape the global economy, and global economic and social relationships over the next few decades. This early career researchers’ workshop is linked to a larger international conference on the same core themes, which concludes the ESRC ‘Rising Powers and Interdependent Futures’ research programme. The workshop aims to give early career researchers an opportunity to present and discuss their research related to the Rising Powers, and to exchange their ideas and findings with peers, senior academics and other experts on the subject. We encourage proposals for papers from across the social sciences, including but not limited to anthropology, political science, development studies, geography, law, and economics. - Full paper submission: 12 May 2017 (max. 8,000 words excl. abstract, notes, references etc.) Papers will be circulated to discussants prior to the workshop. There is no registration fee for the workshop. Refreshments and lunch will be provided. Unfortunately, we are unable to reimburse travel and accommodation expenses. In a recent special issue of Critical Perspectives on International Business Rory Horner observes how established multinational pharmaceutical firms are seeking, with different degrees of success, to alter the intellectual property institutional environment in rising power economies. The contrasting cases of India and South Africa highlight that MNEs’ attempts to fill so-called “institutional voids” may not always fit with societal best interests. Rising power economies are potentially major growth opportunities for multinational companies. In the pharmaceutical industry, the “pharmerging” markets include the BRIC (Brazil, Russia, China and India) countries as well as Mexico, Turkey and South Korea, are a major focus for expansion. Established multinationals counter a different institutional environment in emerging economies. Notably, they can encounter different systems of pharmaceutical patent protection – with either shorter duration and/or narrower scope of patentability in the global South. The rising power economies are currently a key focus of contestation around the setting of IP rules. The dramatic growth of the BRIC countries could potentially challenge the trade rules around patents, including those in pharmaceuticals, which have been mostly driven by firms and countries from the Global North. Continued business and diplomatic pressure from the Global North has and is being placed to secure and maintain extensive and long patent protection, with rising powers subject to particular attention. This was true in the formation of the World Trade Organisation’s Trade-Related Aspects of Intellectual Property Rights (TRIPs) Agreement, as well as recently with intense debate around proposed recent changes in India, Brazil and South Africa. The contrasting cases of India and South Africa are explored in this new article. Although both involve MNEs seeking to influence pharmaceutical patent law, South Africa has been quite prolific in granting patents, whereas India has been less so and has long been a thorn in the side of multinationals as a result. India has also been at the centre of contestation around pharmaceutical patent laws. Benefiting from local technological capabilities and restrictions on MNEs, product patents were removed in 1970 and domestically-owned pharmaceutical companies grew rapidly. With the onset of economic reforms in 1991, India has since risen to become the supplier of the third largest volume of pharmaceutical products in the world. In response, multinationals consistently sought and succeeded in securing patent law change in India, and India was even seen as a key motivation for the broader US efforts in relation to patents in the trade negotiations leading to the formation of the WTO and the Trade-Related Aspects of Intellectual Property Rights (TRIPs) Agreement. Even since TRIPs was agreed to in the late 1980s, multinationals have continued to seek to influence India’s pharmaceutical patent laws. India has constantly featured in the United States Trade Representative’s annual Special 301 Report, introduced in 1989 to identify trade barriers for US companies due to IP laws. India has never dipped below “Priority Watch List” level on the Special 301 Report in its 27 editions to 2015. This pressure continued after India issued its first compulsory license under TRIPs in March 2012 to Natco Pharma to produce Nexavar. South Africa is a contrasting case to India, with a much wider degree of patentability. With patent legislation in place as early as 1916 and the current statute since 1978, a later Intellectual Property Laws Amendment Act was passed in 1997 (subsequently amended in 2002 and 2005) to make South Africa TRIPs-compliant. MNEs have engaged in significant efforts to maintain the relatively broad scope of patentability, notably in two quite recent controversies. 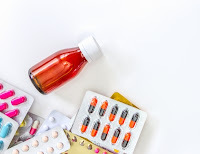 South Africa’s pharmaceutical patent laws initially came to global attention in the late 1990s with a high-profile court case over proposed reforms to the Medicines and Related Control Substances Act to allow for parallel importing and compulsory licensing. The Pharmaceutical Manufacturers’ Association (PMA) of South Africa (mainly comprised of multinational or MNE subsidiaries as members) claimed the proposed reforms were in violation of WTO TRIPs obligations and unconstitutional. The MNE campaign however was visibly challenged by civil society organisations, most notably the Treatment Action Campaign (formed in December 1998). Although the lawsuit was eventually abandoned, South Africa has continued to be quite generous in granting of patents, more than international law requires and lacking many of the flexibilities present in the WTO’s TRIPs Agreement. Recent proposed reforms to South Africa’s laws, in the form of a Draft National Policy on Intellectual Property put forward by the South African Department of Trade and Industry in 2013, have also attracted considerable controversy. Providing for higher standards for patentability, as well as possibilities of pre-grant opposition, the draft policy has attracted concern from international business groups and pharmaceutical MNEs. For example, the proposal was noted in the US Chamber of Commerce’s (GIPC) submission (7 February 2014, USTR– 2013-0040) to USTR’s 2014 Special 301 Report. A campaign coordinated by a firm Public Affairs Engagement, funded by PhRMA and the Pharmaceutical Association of South Africa (IPASA), to derail the reforms, attracted widespread condemnation. This campaign of MNEs attracted criticism from the Director General of the World Health Organisation, from Médicines Sans Frontières and from the South African Health Minister. Rising powers cannot be accurately characterised as “institutional voids” which MNEs should fill for societal benefit, as some business strategy literature would suggest. Instead, in emerging economies, MNEs encounter a plethora of institutions that may be suited to serving local societal interests, such as the growth of emerging economy firms and serving health interests. Ultimately, rising powers may not be expected to inevitably converge towards or emulate those institutional environments practised in the Global North, but instead are likely to set their own agendas in accordance with their increasingly heterogeneous interests. The ESRC project on ‘Rising Powers, Labour Standards and the Governance of Global Production Networks’ and Global Production Networks, Trade and Labour research group at the Global Development Institute, University of Manchester, on 14 October 2016 hosted a talk by Karamat Ali, executive director of the Pakistan Institute of Labour Education & Research (PILER). 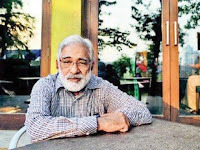 Karamat Ali‘s moving words were imprinted in the minds of everyone seated in the room. Based on 40 years of experience as a labour and development activist in Pakistan, Karamat Ali gave his audience in Manchester a masterclass in building alliances for workers’ rights and sustainability in global production networks. The talk focused on Pakistan Institute of Labour Education & Research (PILER) campaign work for compensation for 254 workers families who died and 55 who were injured in the aftermath of one of Pakistan’s most devastating factory fires, at Ali Enterprises in Karachi in September 2012. Ali enterprises supplied jeans to German clothing retailer KIK. At the outset, it seemed hard to imagine that it would be realistic to achieve compensation for workers and their families. Would it be possible to hold those responsible locally to account? And was there any way of reaching KIK’s headquarters far away in Germany? Karamat Ali took us all through this emotive and arduous journey of how after four years of struggle, workers’ voices resonated across the country and beyond. At the start, PILER began to mobilize locally. This was not easy, because unionisation in the apparel industry was low and thus strikes were not an option to make workers’ demands heard. To get around this problem, PILER decided to look for an alternative way to create public awareness about the loss of lives and injuries of workers sustained in the fire. PILER along with family members of the victims teamed up with a famous Pakistani singer (Jawad Ahmad) to create an evocative you tube video that asked workers to unite. The video was aired by local TV stations and garnered widespread local attention in support for workers’ demands. Parallel to the public campaign, PILER relentlessly pushed for judicial action in Pakistan by calling for a detailed inquiry in court into the causes of the deaths of the workers and to press criminal charges on those responsible for the incident. PILER also built international alliances to initiate a dialogue with KIK and stakeholders in Germany (where the jeans produced by Ali Enterprises were sold). To start reaching out beyond Pakistan, PILER drew on earlier contacts from the European Clean Clothes Campaign. Building on this cooperation, a range of additional NGOs and trade unions in Germany became active on the issue. Initial success was achieved in December 2012, when KIK signed an agreement with PILER to pay an initial US$1 million into a relief fund for victims and agreed to providing long-term compensation. However, reaching agreement on how this compensation should look like took further scaling up of the initiative, not only involving global unions like IndustriALL, but also the German government (which had just launched a new initiative on sustainable textiles) and the ILO. Thus successful partnerships with the German government, global partners, and effective local mobilisation (including national legal procedures), resulted in the disbursement of not only US$ 1 million but a new negotiated amount of US $5 million by KIK in 2016. Against all odds, PILER provided a platform for workers’ voices, in Pakistan, creating ripple effects from Berlin, to the ILO, to the headquarters of KIK, which 4 years ago seemed unreachable. Karamat Ali’s talk speaks of hope, of victory in the face of adversity and to never give up fighting for what is right. Heroes really do exist and we were lucky enough to meet one. He showed us that there is a need to build ‘real alliances’ , – alliances in which those who buy the clothes take responsibility for how they are produced and for those who sit at the sewing machines. This stands testament that improving working conditions of workers leads to sustainable, resilient and conflict-free production networks... something every major retailer needs to hear! 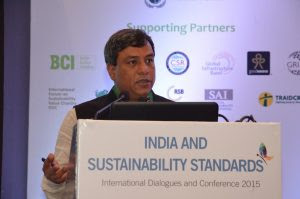 How does India engage with sustainability standards? In November, the Rising Powers and Global Labour Standards team will be travelling to India in order to jointly host a conference alongside Centre for Responsible Business (CRB), a prominent NGO based in New Delhi. 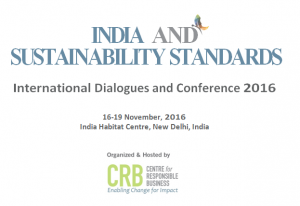 ‘India and Sustainability Standards: International Dialogues & Conference’ (ISS 2016) takes place from the 16-19th November. It presents an exciting opportunity for us to disseminate our research and engage to a broad audience of stakeholders involved in the sustainability field in Asia. The broader theme of the ISS conference is the UN Sustainable Development Goals (SDGs) and how the corporate sector can contribute towards achieving these ambitious goals. There is a broad consensus that governments alone will not be able to meet these goals. However, our research demonstrates there are key roles that government departments and agencies need to play to ensure that businesses can operate efficiently while contributing towards sustainable development. Our project, led by Professor Khalid Nadvi at the Global Development Institute has been concerned with how global labour standards affect production processes, and the ways in which various actors have engaged with the shaping of such standards. Our research has important implications for how effective labour standards can foster responsible business practices. Whilst privately governed ethical standards (such as Rainforest Alliance or Forestry Stewardship Council) have become a key feature of global value chains in which goods and services are sold in Northern markets, there is a growing interest in the ways in which standards may emerge in global value chains across the Global South. Given the huge growth in production and consumption in , Southern markets, it is especially important to understand the extent to which actors in the Global South are also shaping labour standards for local markets. 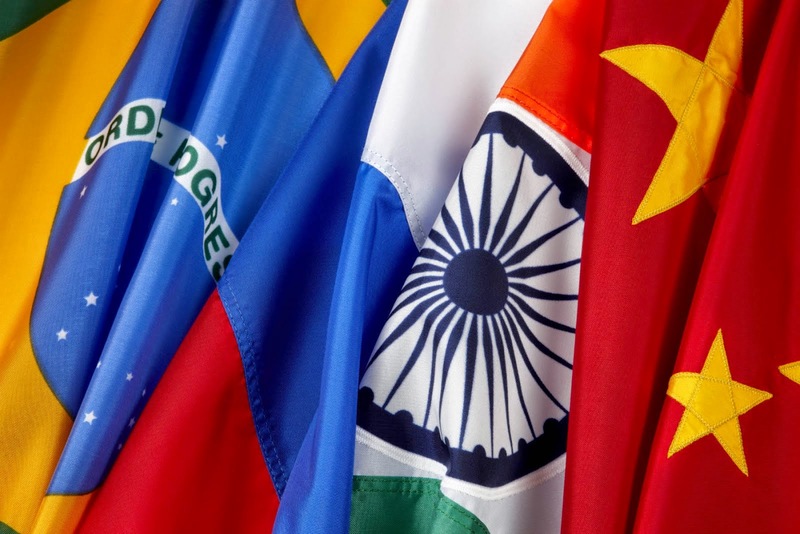 India is one of the three Rising Powers (alongside Brazil and China) in which the project has conducted extensive qualitative and quantitative research, in order to examine this phenomenon. 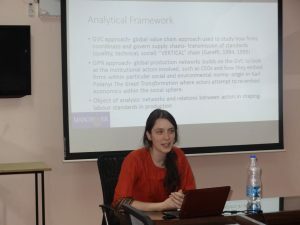 Given that states, firms and civil society organisations are all recognised actors engaged in standard setting, the core research questions of the project focused upon the ways in which these different sets of actors had been exposed to global labour standards, their perspectives and experiences, and the ways in which they seek to shape (or not) labour standards for markets in the Global South. As a PhD student on this project, I have been lucky enough to gain a great deal of insight into the ways in which Brazil, China and India have engaged with the standards agenda through my interactions with the senior academics attached to the project. Professor Nadvi has assembled a truly global team of academic experts; from local colleagues at Alliance Manchester Business School through to Professors based in India, China and Brazil who have all contributed their knowledge and experience to the project. My own research has focused on India in particular, and the conference is an opportunity for me to present my findings on Trustea, a new standard for the Indian tea industry which is specifically focused on the domestic market. I explore the role of both global and national actors within the development of the standard, and how the interactions between state, civil society and lead firms within Trustea has contributed to new forms of governance of social conditions within the Indian tea industry. We’ll also be presenting our research related to Indian lead firms, civil society organisations and the state in relation to global sustainability standards. Professor Rudolf Sinkovics from Alliance Manchester Business School as well as Professor Peter Knorringa from the Institute for Social Studies (ISS), based in The Hague, Netherlands will all be discussing their latest findings as contributors to the Rising Powers project. The conference has been organised by Dr Bimal Arora, Chairperson for Centre for Responsible Business. This blog post was originally published on 14 October 2016 on the development@manchester blog. The ‘Rising Powers’, especially China, India and Brazil, have now become key players in the global economy. Yet, we still know too little about how these economies are engaging with and potentially shaping, the rules that govern international trade and global production, in particular global labour and social standards. For producers around the world, meeting international standards on social and environmental sustainability is increasingly critical. We are now more aware about the food we eat and how it came to our plates, or whether what we wear implied sweatshop labour. 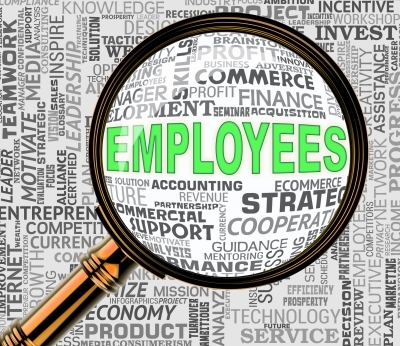 Nonetheless, gains from social compliance – especially for workers and poor producers – remain unclear. Expanding trade between the Rising Power economies, their growing domestic consumer markets and the emergence of leading firms from China, India and Brazil raise questions on how global standards will be shaped in the future, who the key drivers will be, and what implications arise for workers in both these emerging economies and throughout the global economy. Full paper submission: 12 May 2017 (max. 8,000 words excl. abstract, notes, references etc.) Papers will be circulated to discussants prior to the workshop. Accommodation costs in Manchester will be covered for authors of accepted papers. We live in a globalised world and buy products produced by workers’ from all over the World. Increasingly consumers are demanding that those who produce our goods are employed on decent terms and conditions whether they work in Europe, Africa, India, Russia, China or South America. Sweatshop labour used in one continent is often named and shamed in another and these reputational effects can affect demand for goods. But as consumers ask for more fairtrade goods from the developing world, workers in the so called global North are finding that their employment is more insecure, as greater numbers are employed on zero hour contracts, while all workers are finding it harder to access employment tribunals to enforce their employment rights. The Centre for Business Research at the University of Cambridge has turned conventional wisdom on its head, and through a series of quantitative research projects over a number of recent years, has constructed a new database that reveals how improvements in labour rights can lead to increased productivity and employment as well as greater equality in society. These datasets are now online for others to access and use. International organisations are taking note of these findings and national governments would do well to consider them. Globalisation, rather than inducing a so called ‘race to the bottom’ as many commentators predicted, is making governments more aware of the need for improved protections for workers, and of the importance of enforcement. Better informed and discerning consumers who are switched on to the web and social media where they can check the sourcing of the products they buy, along with campaigning civil society groups and NGOs, are helping to enforce these values. The statistical studies carried out by the CBR complement qualitative research carried out by the Global Development Institute at The University of Manchester. In a recent CBR workshop held in Cambridge in September 2016 researchers from both Universities discussed the findings from ESRC-funded research on labour law reforms, labour standards and corporate social responsibility (CSR) practices in Rising Powers, including China, India, South Africa and Brazil. Many commentators have doubted that worker-protective labour laws can be made effective in developing countries with high levels of informal work and weak states. This has led to interest in alternative modes of regulation including codes of practice and consumer boycotts focused on global supply chains. But this focus neglects important changes on the ground in low- and middle-income countries in Africa and Asia which over the past decade have been implementing systematic reforms to their labour laws and codes, sometimes after much publicised strikes. Admittedly the aims of these reforms are diverse: they include promoting industrial peace, encouraging employers to invest in training, and cushioning the effects of labour migration. Often these interventions have had the effect of encouraging formalisation of work and building state capacity. 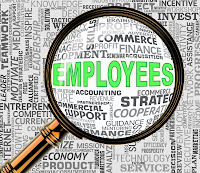 They have also operated in conjunction with, rather than in opposition to, voluntary measures and soft-law initiatives aimed at improving labour governance in value chains. Encouragingly, while there are still many difficulties associated with the operation of labour standards in emerging markets, empirical work is revealing a more complex and differentiated picture than that frequently presented. There is good reason to be optimistic about these trends. Results from quantitative research analysing a unique dataset of labour laws around the world, constructed at the CBR in Cambridge. Research from fieldwork conducted in case study countries, including China, Brazil, India, and South Africa, by teams based respectively at the Universities of Cambridge (Simon Deakin and colleagues) and Manchester (Khalid Nadvi and colleagues). The research undertaken by the Cambridge team deploys a unique dataset, the CBR Labour Regulation Index, which codes for labour laws in 117 countries over the period 1970 to 2013 (43 years). It is the first time that the laws of so many countries have been coded in this way and the dataset will be of very considerable interest to research users and policy makers. The fieldwork research also breaks new ground in offering in-depth analyses of the implementation of labour law reforms in such contexts as Guangdong province in China, and on the interaction of labour laws with private labour standards operating in global supply chains. The qualitative case studies undertaken by the Manchester team explore how lead firms in the rising powers engage with labour standards and CSR practices in their now increasingly global supply chains, and investigate the influence of civil society actors as well as the state in the development of private regulatory initiatives and in framing the discourse on labour standards. Listen to our CBR podcast series that features interviews with speakers at the workshop on Labour Standards and Labour Law Reforms in the Rising Powers, held in Cambridge on 5-6 September 2016. 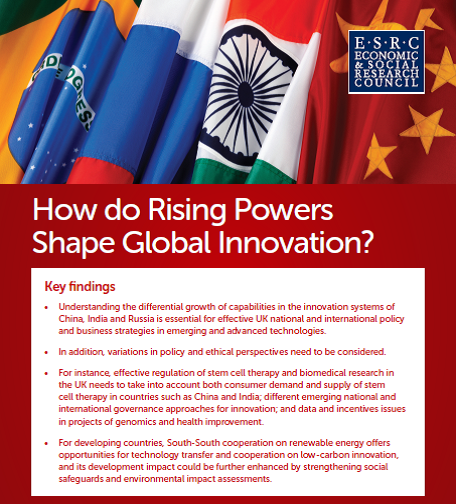 How do Rising Powers Shape Global Innovation? On 6-7 October 2016, the Manchester Institute of Innovation Research and the ESRC Rising Powers and Interdependent Futures programme hosted a thematic workshop to discuss the roles of rising powers in shaping global innovation. Our policy brief summarises the findings and practical implications that come out of different projects under the ESRC programme working on the theme of innovation. Overall, the research findings discussed at the workshop underline that the Rising Powers, such as China, India, and Russia, represent one of the key drivers of global economic and social change today. Notwithstanding recent short-run fluctuations in economic growth, these Rising Powers are becoming increasingly important players in global innovation. Non-Western models of innovation challenge Western approaches to research and development in some areas, but also offer opportunities for research cooperation and technology transfer. The emergence of Rising Powers as global players in key technologies, but also the need to look more closely at the differences between them, can be seen from the findings of our project on Innovation Systems Development in China and Russia. Both China and Russia have undergone periods of market reform and developed new strategic goals for their innovation policies that show some parallels, for instance in the field of nanotechnology. Despite these similarities China appears to be more clearly on a path to becoming a world-leading country on innovation than Russia. For the UK, innovation developments in China, as well as in other Rising Powers countries, can present new collaboration opportunities although they also heighten competition for leadership and global market success in emerging and advanced technologies. This is also apparent from the research presented by our project at King’s College London on state strategiesof governance in global biomedical innovation in China and India. The emergence of bioinformatics, meaning tools that make biology legible with the help of computer science, is changing the way science works. This opens new opportunities for Rising Power countries to establish themselves in this new territory. Western models of innovation have dominated global research on bioinformatics, but increasing engagement of Rising Powers such as China and India in the area of bioinformatics could challenge established norms and practices of research in Western countries. Effective regulation of biomedical research in the UK needs to take into account stem cell therapy in countries such as China and India, different emerging national and international governance approaches for innovation, as well as data and incentives issues. As a collection, our projects show that the Rising Powers’ engagement in innovation has a profound impact beyond their borders, both in the UK and globally. Within the UK, policies on research and innovation need to take innovation dynamics in countries such as China, Russia, and India into account to be effective. Globally, innovation and technology transfer from the Rising Powers has the potential to address key policy challenges such as climate change, provided that social and economic side effects of South-South investment projects are dealt with effectively. 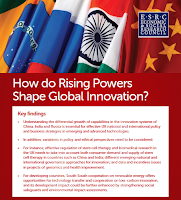 For more details, please refer to the full thematic policy brief on 'How do Rising Powers shape Global Innovation?' produced by the ESRC Rising Powers and Interdependent Futures programme. For a more general overview of the findings of all 12 research projects under the Rising Powers and Interdependent Futures programme, please have a look at our briefing on 'How do Rising Powers Drive Global Change? '.